Are You Holding Out on Your Readers? | Plot to Punctuation Plot to Punctuation: Are You Holding Out on Your Readers? Are You Holding Out on Your Readers? An enormous part of novel-writing turns out to be an information management job. You have to manage the information your characters have, how information passes between characters, and what information you give to readers. It's your story, so you might think you can give information to readers however and whenever you like. But this is not so. Turns out, readers have some expectations--and quite reasonable ones--as to when you will deliver certain kinds of information to them. When your story doesn't live up to these unwritten rules, readers will object. Why do readers have these rules? Think about what readers do while they're reading. When you're reading, I'm sure you do it, too. You read, taking in descriptions and characters names. You learn who the characters are and how they all relate to one another. You figure out who are the heroes and villains. You learn about what the characters can do, what resources they have at their disposal, and all that other stuff. You pull all that information into your mind in order to do one thing: build a coherent mental model of what's going on in the story. This model is pretty important. As a reader, it is your basis for making inferences about how the characters are feeling and what they're thinking. It's how you anticipate fights that might happen, shocking discoveries that might be made, etc. And when characters do stuff and make choices, that model is the basis on which you judge whether those actions are plausible, sensible, or whether the character is making a mistake. For readers to be genuinely engaged in your story, they need to be able to infer, anticipate, and judge. That's what your brain is busy doing when you're reading a book you can't put down. That's why it's fun, because the story is giving you lots of stuff to think about. Of course, this mental model is not static. Readers also track every new piece of information so their mental model stays up-to-date with changes in the story. You must give readers all information that is materially important to their mental model in advance of when that information would be needed in order to make meaningful inferences, anticipations, and judgments. The whole point of this rule is that readers have a fair-play expectation that the story won't hold out on them. That they will at least have a chance to anticipate whatever twists or revelations you throw at them. Whether they do or don't is on them, but they deserve (and rightfully so) a fair chance to try. This rule doesn't apply to immaterial facts--e.g. the color of the couch in the room where the body was found or whatever--but it does apply to anything that relates to the plot. The acid test for whether a piece of information is materially important is this: If you changed the fact in question, would anything else in the storyline be forced to change? If yes, then you have to find a way to present the information before readers would need it. Does this mean you can't surprise your readers? This is the obvious writer-centric objection. If you have to tell readers everything up-front, how are you ever supposed to surprise them with a good twist? The secret is in how and when you deliver the information. The best way to do it without tipping your hand as to the importance of the information is to deliver it early, and in some scene where that information can masquerade as being immaterial. The most fabulous example of this I can think of is from Harry Potter. The resolution of the entire seven-book conflict between Harry and Voldemort comes down to an obscure fact about wands. Namely, that "the wand chooses the wizard." Now, ask yourself where did J.K. Rowling deliver this piece of critically important information? Notin book seven, right before the final showdown, and definitely not in book seven after the showdown had concluded, as an explanation for the showdown's outcome. No. Rowling delivered this piece of materially important information at the absolute first possible opportunity: way back in book one when Harry is acquiring his wand along with his other school supplies. 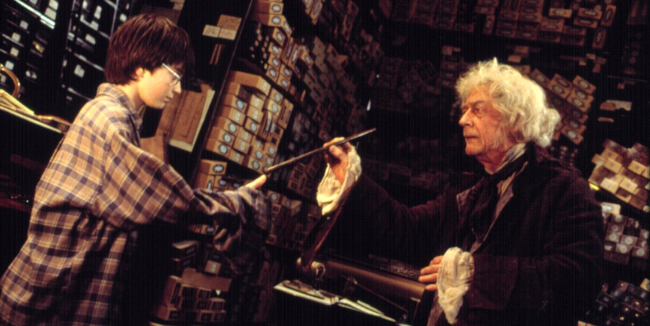 In that scene, the wandmaker offhandedly comments that the wand chooses the wizard. But in that scene, it feels immaterial. It masquerades as just another weird aspect of wizarding life Harry is discovering, on par with how owls deliver mail and that the bank is run by goblins. We read it, we tuck it away somewhere in the depths of our mental model, and then we forget about it for the next six and three quarters books, until wham! Rowling slams us with the critical importance of this fact--that we knew all along but hadn't paid any attention to--at the moment when that fact is most relevant. That's how your surprise your readers. And we can't be mad about it, either. We cannot cry foul play, because she told us about the wands, fair and square, right in the beginning. It was in our mental model all along, giving us the chance to anticipate what might happen in the final showdown. The writer's critical sin of information management is thus not delivering all the materially important information ahead of time. If you deliver it right at the moment where it matters, readers cry foul because they feel like you're changing the model on them right at the last second in order to jerk the plot around however you want it to go. Sometimes you'll hear that referred to as "deus ex machina" plotting. If you deliver the information after it matters, they cry foul too, because in both cases you have denied the reader the chance to infer, anticipate, and judge. And remember, that's where the fun is. Ultimately, readers object to withheld information because it ruins their fun.